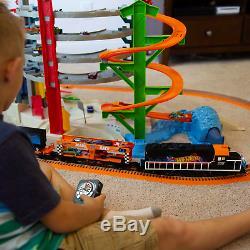 Lionel Trains Hot Wheels LionChief Ready to Run Train Set with Bluetooth Control. 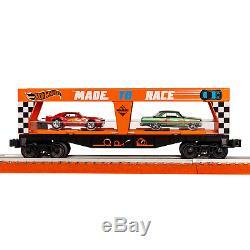 Transport your favorite cars in style with this train set. Celebrates 50 years of Hot Wheels cars. 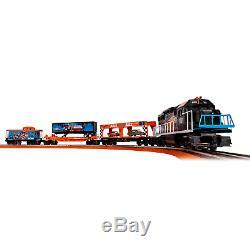 Features a spine car with trailer, caboose, and auto loader. Makes diesel revving and other realistic background noises. Comes with engineer and fireman figurines. Combine your favorite toy car with your favorite toy train and you'll get the Lionel Trains Hot Wheels LionChief Bluetooth Train. 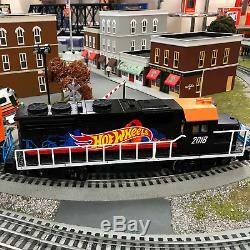 This locomotive was made in honor of the 50 year anniversary of the creation of Hot Wheels! Fit for a big celebration, it combines colors, lights, and realistic sounds to give you an authentic train experience. With a spine car, trailer, caboose, and auto loader, your collection will get a much needed upgrade full of a variety of different pieces. Get this train set while it's hot! Track includes 8 curved O36 FasTrack sections, 1 10-inch straight lock-on section, 1 terminal section, and 4 straight FasTrack sections. Powered by a wall-pack electric power supply. Comes with LionChief remote, but can also be operated through the LionChief Bluetooth app. Dimensions (L x W x H): 18.5 x 17.4 x 9.5 inches. 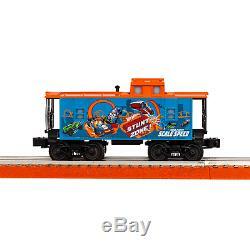 Hot Wheels LionChief Bluetooth Train. When Lionel founder Joshua Lionel Cowen's immigrant family arrived in New York after the Civil War, the railroads were literally America's engines of progress. The "Golden Spike" meeting of the Union Pacific and Central Pacific lines in 1869 unified the continent and signaled the birth of a world power. Cowen was born in 1877, just before Edison's first electric light. He grew up with real trains, amid dizzying change. Around the time he founded Lionel in 1900, passenger lines like the peerless Twentieth Century Limited symbolized American technology and sophistication. Cowen was already a successful inventor when he created his first toy train. But The Electric Express and its offspring soon became a sacred mission, and Cowen would spend a lifetime stoking America's imagination with the romance of the rails. He told boys that Lionels would prepare them for adulthood. Soon Dads too were encouraged to join Youngsters in model train enthusiasm, to future father-son bonding. With growing prosperity, Lionel's layouts cropped up in more living rooms, especially at Christmas. Before mid-century, railroads were our economic lifeblood, as well as cultural icons -- but it was not to last. That decade saw the tragic demise of New York's Pennsylvania Station, the retirement of The Twentieth Century Limited, and the passing of Joshua Lionel Cowen. But now the Lionel dream is back and better than ever. As Lionel looks to the future, it strives to ignite the imaginations and hearts of todayâ?? S children and adults through continued success with branded and licensed products, an increased presence in the digital space and recapturing its rightful place â?? Through partnerships with evergreen brands such as NASCAR, Warner Bros. Crayola, Coca-Cola, John Deere and many others, Lionel has lined itself up for guaranteed success for many years to come. 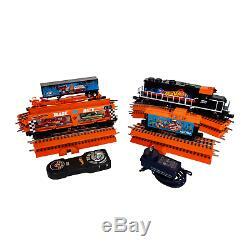 With innovative products such as the LCSÂ®, iCab, Battle TrainsÂ®, Lionel Tracks and a revamped, more user-friendly Lionel. Com, the 115-year-old company has made sure it stays on the cutting-edge of technology. The Lionel name has always been synonymous with Christmas and a train set under every Christmas tree, and now more than ever the companyâ?? S ensuring that they are a major player in any holiday plans. For Lionel, the future is indeed bright. Explore a timeline of our history.. This listing is currently undergoing maintenance, we apologise for any inconvenience caused. 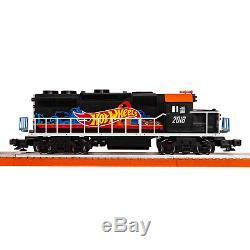 The item "Lionel Trains Hot Wheels LionChief Ready to Run Train Set with Bluetooth Control" is in sale since Wednesday, October 10, 2018. 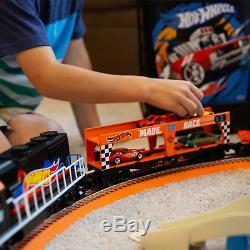 This item is in the category "Toys & Hobbies\Diecast & Toy Vehicles\Other Vehicles\Contemporary Manufacture". The seller is "vminnovations" and is located in Lincoln, Nebraska. This item can be shipped to United States, Canada, United Kingdom, China, Mexico, Germany, Japan, Brazil, France, Australia, Denmark, Romania, Slovakia, Bulgaria, Czech republic, Finland, Hungary, Latvia, Lithuania, Malta, Estonia, Greece, Portugal, Cyprus, Slovenia, Sweden, South Korea, Indonesia, Taiwan, South africa, Thailand, Belgium, Hong Kong, Ireland, Netherlands, Poland, Spain, Italy, Austria, Bahamas, Israel, New Zealand, Philippines, Singapore, Switzerland, Norway, Saudi arabia, Ukraine, United arab emirates, Qatar, Kuwait, Bahrain, Croatia, Malaysia, Chile, Colombia, Costa rica, Panama, Trinidad and tobago, Guatemala, Honduras, Jamaica, Antigua and barbuda, Aruba, Belize, Dominica, Grenada, Saint kitts and nevis, Saint lucia, Montserrat, Turks and caicos islands, Barbados, Bangladesh, Bermuda, Brunei darussalam, Bolivia, Ecuador, Egypt, French guiana, Guernsey, Gibraltar, Guadeloupe, Iceland, Jersey, Jordan, Cambodia, Cayman islands, Liechtenstein, Sri lanka, Luxembourg, Monaco, Macao, Martinique, Maldives, Nicaragua, Oman, Peru, Pakistan, Paraguay, Reunion, Viet nam.